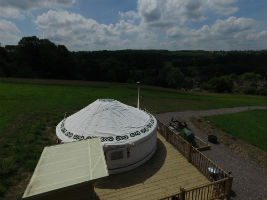 Located in the hamlet of Lower Vobster in Somerset, Glamping on the Hill is ideally placed for those looking to explore Bath, Longleat, Wells, Glastonbury and a host of small villages all under 30 minutes drive. The area has miles of walks, lots to get out and discover as well as enjoying the peace and quiet of our special hidden area of Somerset. You will be surrounded by nature. 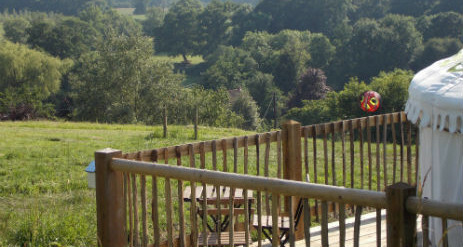 Imagine waking up to birdsong and hot Croissants off the wood burning stove! Kingfishers, ducks, moorhens, dragonflys, herons, roe deer, peregrines and otters are all frequent visitors. 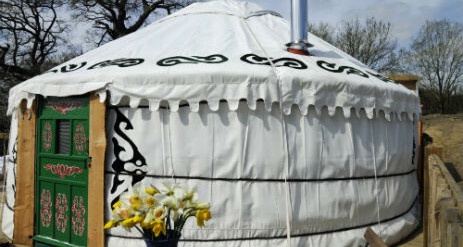 Our two Authentic Mongolian Yurts Daisy and Buttercup are a short walk up our hill that overlooks the beautiful Mells Valley. Cars are left in the Inn’s large car park. 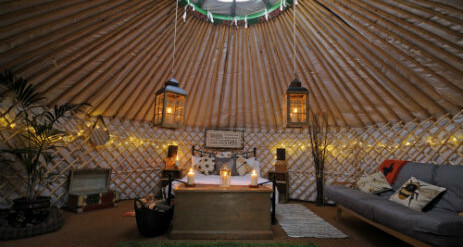 Both yurts can sleep up to 6 with a double size bed, pillows, duvets, fresh linen and towels all provided. Also featuring a wood burning stove, fire-pit, BBQ and induction hob make catering fun and easy. Each tent has a picnic hamper of crockery and utensils to swap on a dirty for clean basis so there is no washing up! 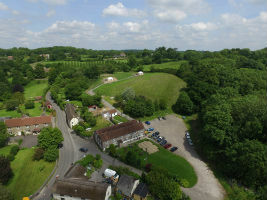 However, situated at the bottom of the hill is also our award winning Inn. Prices also include tea and coffee, sugar, hot chocolate and a basket of logs. 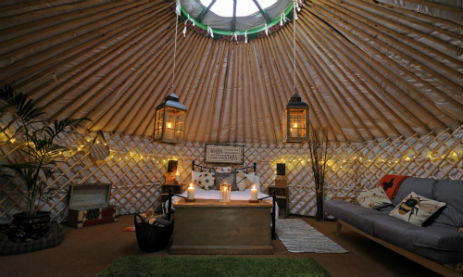 Each yurt has its own private hot shower and flushing loo situated directly behind the Yurt. 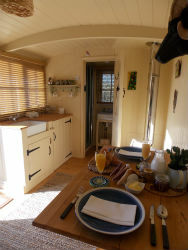 Pippin and Shawn are two superb, individually decorated en-suite Huts. 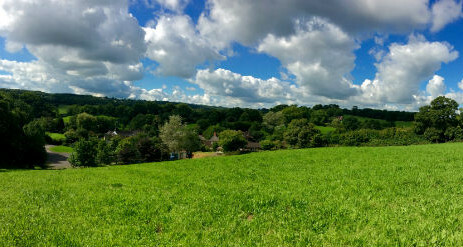 Shawn is situated at the top of the Hill with stunning views over the Mells Valley. Pippin is at the bottom of the Hill and set in its own Cottage Garden. 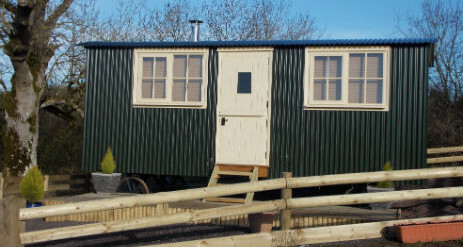 Each have Double Beds, Kitchenette, Shower and Toilet, BBQ, Decking. 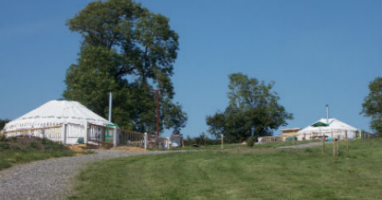 Glamping on the Hill awaits you, your hens or your getaway girlfriends for a stay filled with activities to suit everyone’s taste and budget. Fill your stay with as much or as little as you want. Two night’s accomodation, continental breakfast served in the Inn on both days, all bedding. £45.00 per person per night. Extras Poppy the Chill Tent Five meter bell tent with loads of cushions, bean bags, knicker bunting, coir matting, fairy lights, a great way to get together without having to use one of the Yurts. 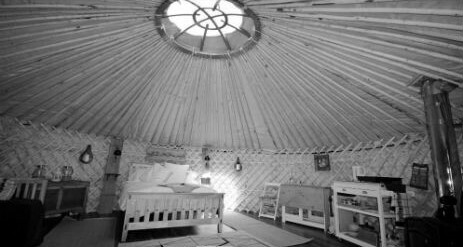 Can also be used as supplementary sleeping for 5 people if you are more than 16 who can use the nearby Showers/Toilets of the Yurts/Hut. Available April-September. £12.00 per person for the weekend. 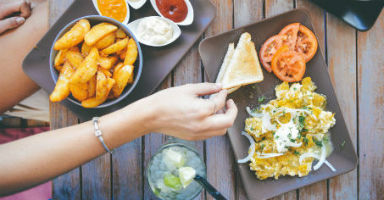 A great way for you all to meet up without having to worry about cooking, especially on your first night. An informal family style supper, served in the Inn. £2.50 per person per session. Put on your raincoat and take a Wellie Walk! There may be a minimum 2 night stay at certain times of the year and some dates may have a minimum guest number requirement.